I’m a Lancashire artist inspired by the landscape of the West Pennine Moors. I love Lancashire’s changing seasons, misty hills, high grassland and deeply wooded cloughs. 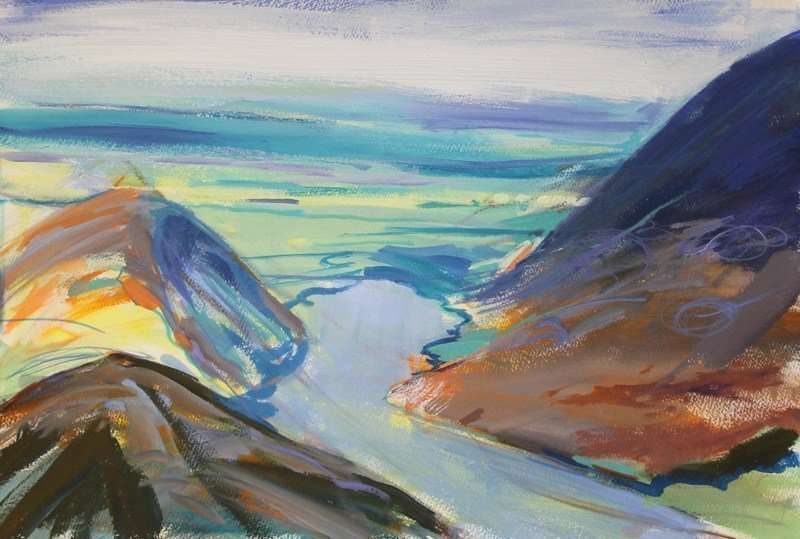 The Pennines are a contrast of wild and uninhabited moors and busy, industrial towns and painting them is a constant challenge but it’s a challenge that I relish. My paintings are a way of exploring the landscape visually; understanding how it works, why the colours are so beautiful, and why the whole landscape is so much more than the sum of its parts. 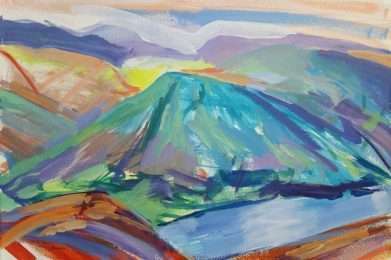 As a Lancashire artist I’m lucky to live and work in one of the most beautiful parts of the county and I hope you enjoy my paintings as much as I enjoyed painting them. I’m mesmerised by the effects of light: how sunlight breaks through clouds, how the rain clouds bring drama to the high moorland landscape, how sunsets create contrasts that defy description with just words. Colours amaze me: subtle greys and pale misty tints in the woods in the rain, the fresh green of new leaves in the spring, the contrasting reds, orange and blues of a dramatic sunset over the sea. Faces and figures intrigue me: strangers, portraits of loved-ones and relatives, and quick sketches of fellow passengers on the train. If I can capture the essence of these things in my paintings, I’m very, very happy! Painting the sea is a real joy. Seascapes are always challenging because the sea is in a constant state of flux, with tides, winds and the weather dominating the scene. 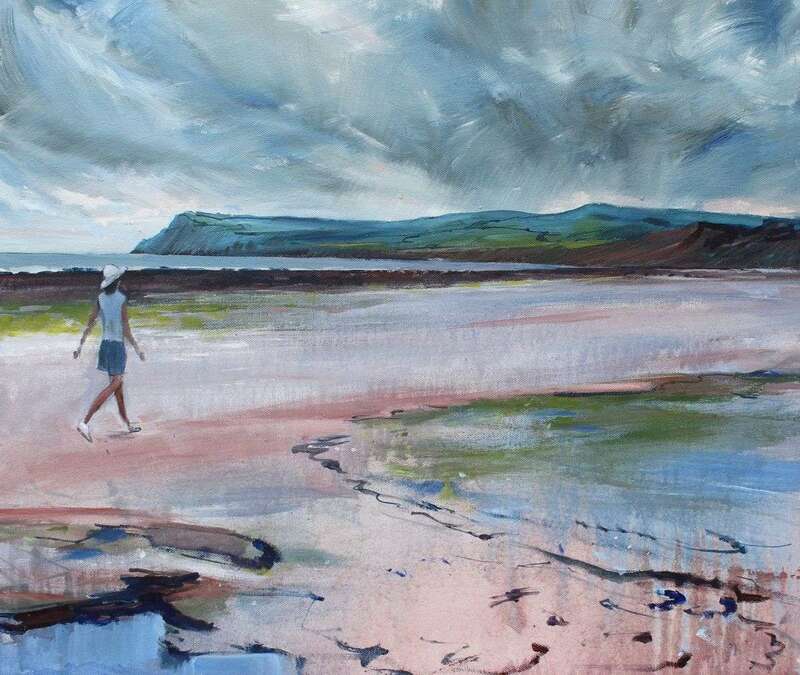 Blackpool is a favourite place to paint but also Whitby and the Welsh coastline along the Llyn Peninsula in the north and Pembrokeshire to the south. 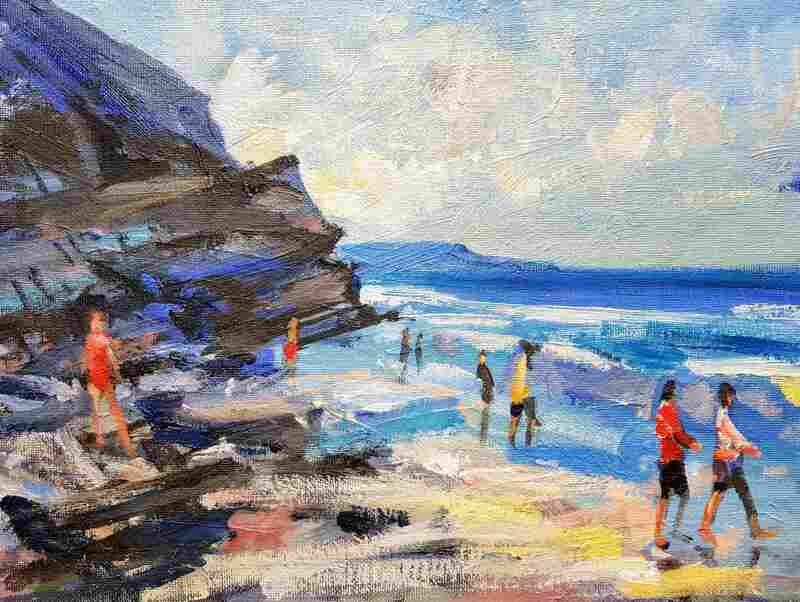 The sea has drama, light and shade, holidaymakers, ice cream and sometimes even sunshine. When I paint a seascape I’m always trying to capture the movement of light on the sea because this movement never stops – it’s a constantly changing battle between nature, which never wants to stay constant, and the painting, which is of its very nature a motionless freeze-frame capturing of a single moment, perhaps from a single hour within a single day. Of course I never truly ‘win’ the battle, but sometimes I’m nevertheless happy with the painted result! 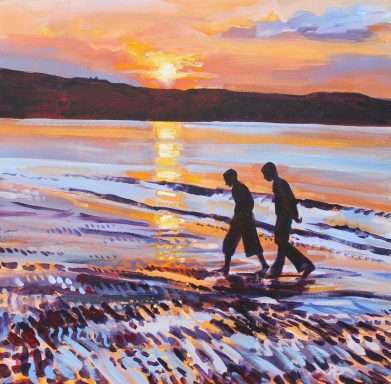 On this site you’ll find a range of my seascape paintings – hopefully you’ll find one that you love. Here are a selection of recent paintings. You can also commission me to paint your ideal painting. See the link in the menu above. 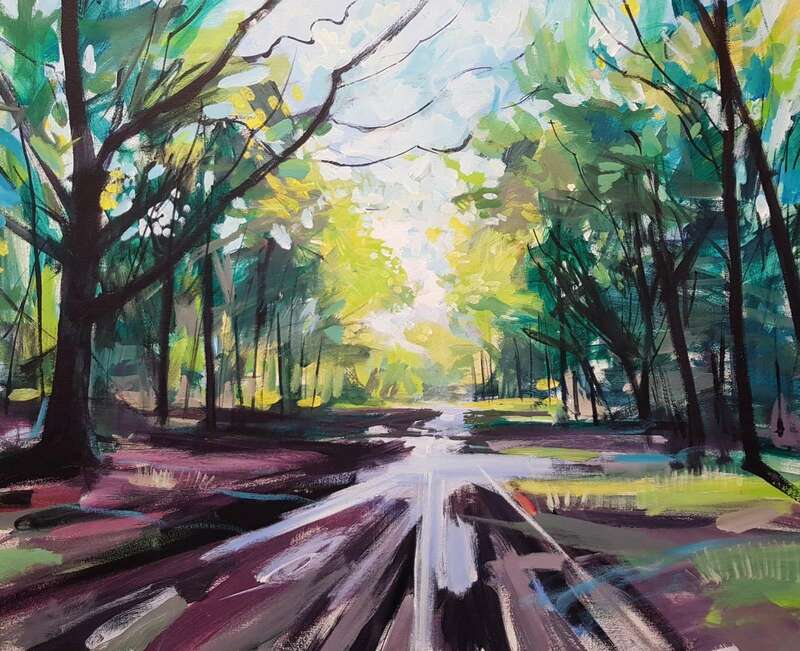 If you can’t find the ideal painting for you on this site, but like the type of paintings I create, why not commission me to create a painting for you? 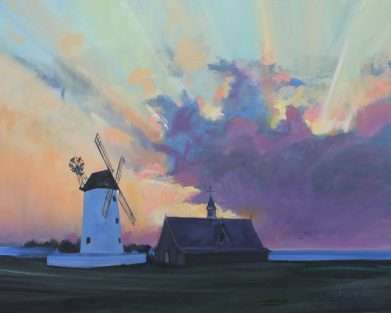 In the past, I’ve painted favourite views, holiday seascapes, memorable portraits – even much-loved pets. The prices for commissions are broadly the same as the prices you see for my other paintings – between £150 and £400 depending on the size and complexity of the subject matter. 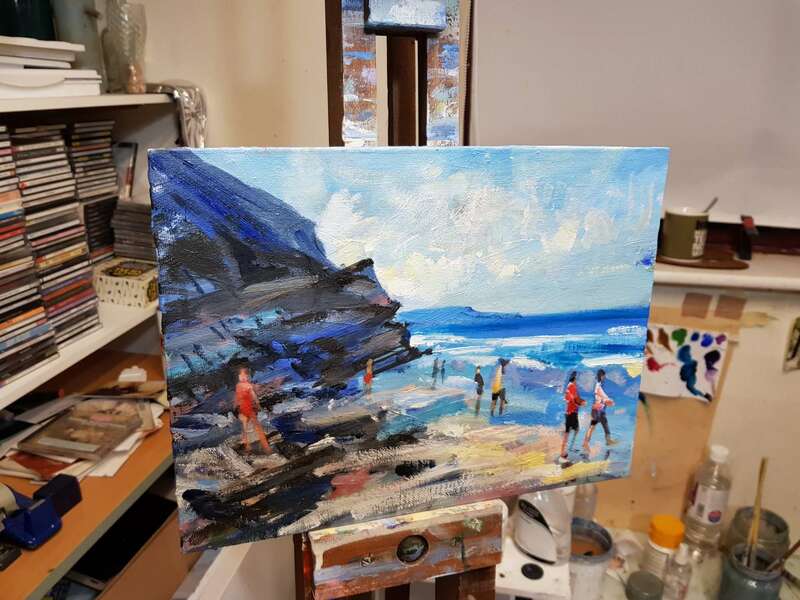 The process is simple: once we’ve agreed on the subject and price I email you lots of photographs of the new painting ‘in progress’ and I welcome comments and suggestions as the painting develops. When we’re both happy with the result I can either send you the painting unframed, or I can get the painting framed for you. 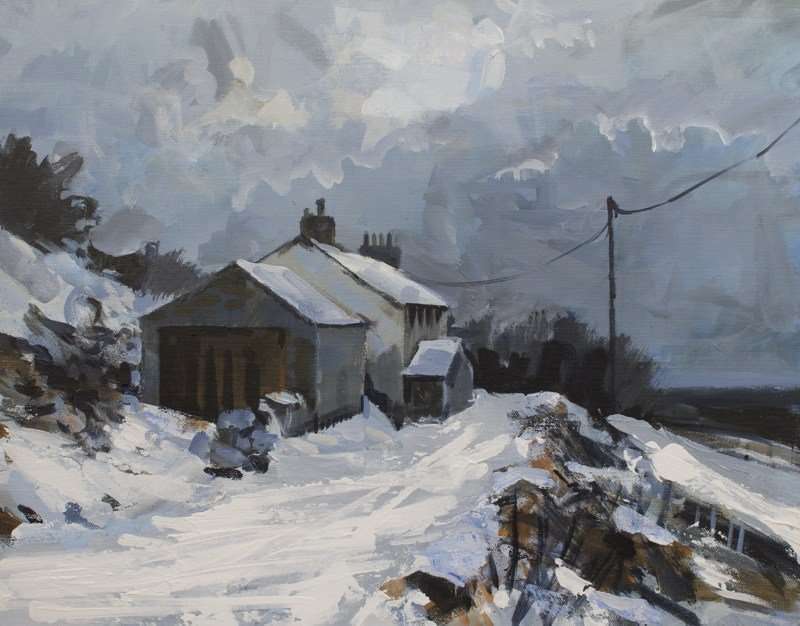 I’m a Lancashire artist who was born in Bolton and I still live here on the edge of the moors. So this is where I feel most at home, and it’s this landscape that inspires most of my paintings. As you browse this site you’ll see lots of Lancashire paintings based in the Lancashire area: Bolton, Horwich, Rivington, Chorley, Tockholes, Adlington are all represented in my paintings. When I finish new paintings, organise a new exhibition or have exciting news, I send out a monthly art studio newsletter. The monthly newsletter also features a ‘painting of the month’ – one of my best paintings offered at a substantial discount. I’m delighted to be able to offer a range of fine art prints of my favourite paintings. Each print is signed by me and printed using the giclee print method. Giclee is a special printing process used by fine artists and photographers because it offers very accurate, vibrant colours and because the prints are very long lasting and do not fade over time. I’ve been selling art online since the late 1990s. I’m proud to say that hundreds of my paintings have been sold to collectors worldwide. 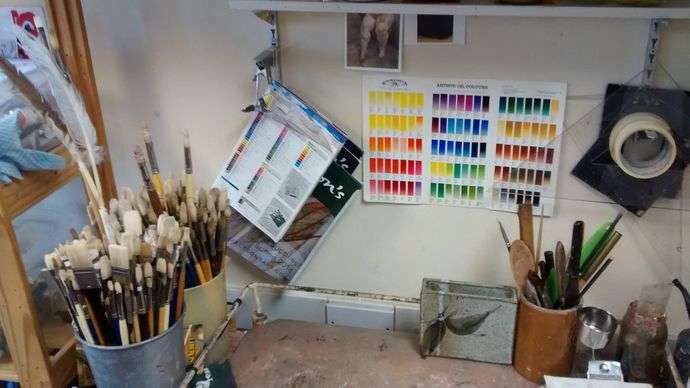 My studio is in Horwich, near Rivington. I’m married with three children. I keep going back to Whitby, a favourite location of mine for painting. The beach and the harbour are perfect for my style of paintings – blending traditional seaside, working harbour, abbey and characterful old ‘yards’. I visit regularly and every visit inspires more paintings. As most of my paintings are based in the landscape, I spend a lot of time outside, just walking and sketching. 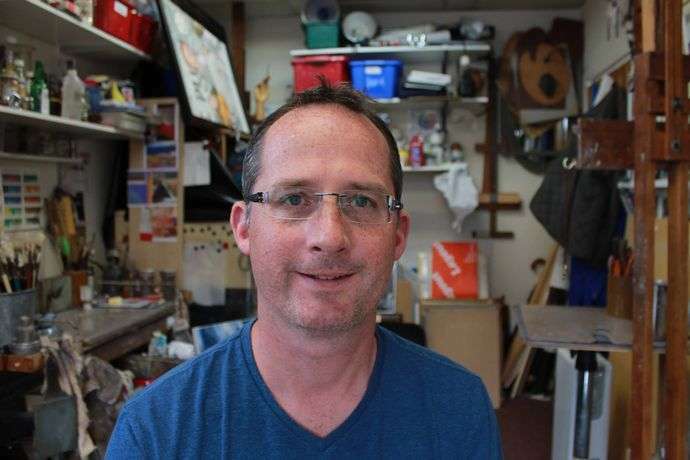 Back in the studio I usually work in oils or acrylic paint on traditional canvas or smooth MDF panels, starting with a smooth surface and building up layers of luscious paint. 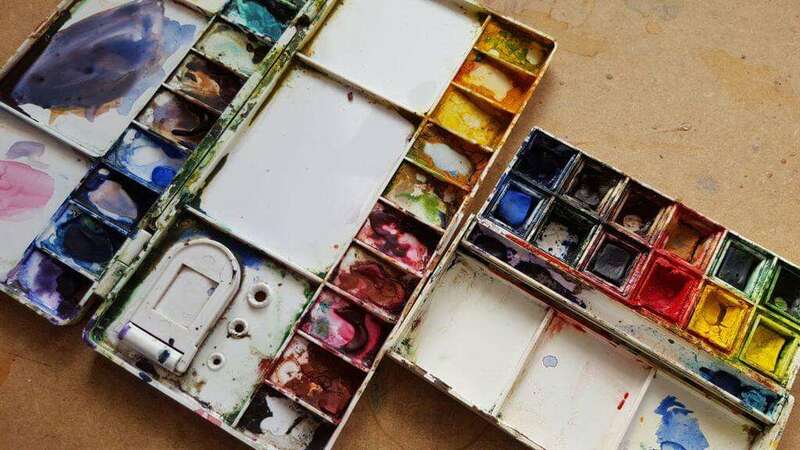 The way I paint is very laid back – I seldom pre-plan my paintings and I usually just ‘go with the flow’. I do work slowly and build layers of paint over an initial sketch – often revising and removing previous layers of paint. As the painting progresses, I add details and constantly adjust the colours, tones and shapes so that slowly but surely the image emerges from chaos.